Drywall is one of the most common materials used to make walls and ceilings in houses, buildings and garages. It's made up of gypsum plaster which has additives in it to make it water resistant, helps to prevent the growth of mold and it is fireproof. It's extremely versatile. The hard part about drywall is installing it and finishing it. Typically, it takes a couple of people to hold the drywall sheet in place while someone screws it in to the wall joint or the ceiling joist. This can get pretty difficult. So, in the construction industry, Contractors use what is called a drywall panel lift. 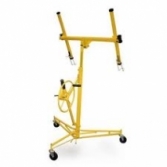 A drywall panel lift is a device where you find the center of the drywall and hook it to the hoist. Depending on the powered system lift you have, it then lifts the drywall up to the wall or ceiling where you want to install it and holds it there so you can secure it. They come in many different designs and many different brands and of course that affects price. Some are only for the walls or are only a ceiling lift and some can do both. First of all, some of the best brands to buy for a drywall panel lift and its parts would be Sumner, Canada, Prohoists, Telpro and Troy. Although they may be pricey, you can be assured that they make top quality and durable panel lifts. If you're the average person who is taking on a project on your own, you can find a drywall panel lift at your local hardware store such as Lowes, Home Depot or Harbor Freight. There are different designed panel lifts. You have the foot lift where you have a pedal that you step on to control the hoisting of the panel. You could also use a jack lift or an electronic lift. One of cheapest is the hand crank. One of the fastest is using an electric drill to access the winch to lift the panel. If your drywall lift panel is not tall enough, you can also buy an extension for it. The best place to buy lifts, lift tools and their parts would be online and used. People are attracted to the price tag. And if you know what you're looking for and what you're looking at, you'll definitely be saving some money which could prevent you from spending more in the long run.